Vanessa writes: "This was the first time we ever took a tour and it was definitely worth it! My parents and I really enjoyed the 6 Day East Coast Tour because we accomplished so much and got to visit every site that we wanted." From Andrea: "My boyfriend surprised me with this tour for our two-year anniversary. I loved every moment of it! New York was a blast. We got to see the bright lights of Times Square and Lady Liberty. My personal favorite, the stores along 5th. We truly ..enjoyed the D.C. landmarks and the Freedom Trail in Boston." The EAST COAST of the USA is a wondrous mixture of the exciting history, culture and natural beauty of the eastern seaboard. Cities and states that are well known even if you have never travelled to the region instantly conjure up images in your mind. Explore the crashing waves and seaside culture of the East Coast. Visit the famous Nubble Lighthouse and Kennebunkport. See the summer home of former President George Bush at Walker Point. Hampton Beach. Where else along the Seacoast can you find 80 free evening concerts taking place throughout the summer and fantastic fireworks displays every week? Boston, the Tea Party and Autumn leaves. 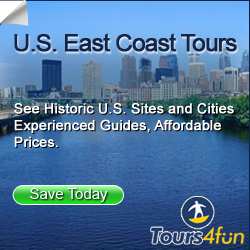 Fall Foliage, History, Arts and Culture; the picturesque southern gateway to New England. New York City: The "Big Apple" is one of the most popular travel destinations in the world, famous for Shopping, Broadway, the Empire State Building, the Statue of Liberty and Food! Want to see the very best New York City has to offer but don't have a lot of time? Well, have we got the perfect tour for you! 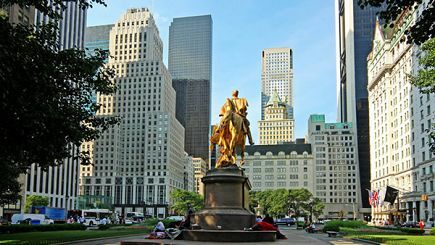 Our New York City 1-Day Tour takes you to the hottest tourist destinations in New York City! Join your experienced, knowledgeable and friendly tour guide for a romp through the Greatest City in the World! See all the major NYC tourists attractions! Book your hotel first, then the airfare. Hotels often fill up quickly for conventions and other special events and during these periods, you'll pay dearly, if you get a room at all. "The City of Brotherly Love" is not exactly on the East Coast but we thought we'd include this popular destination anyway. 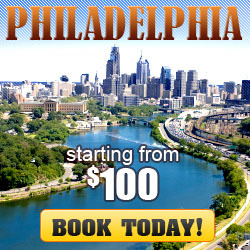 One of America's oldest and most historical cities, modern day Philadelphia (PHL) is a thriving city with lots to see. Filled with reminders of American formative history, Philadelphia is a rich mix of traditions and a vibrant arts and culture scene. Atlantic City: Casino gaming, Spas, World-class entertainment, Nightlife, Fine Dining, Ocean Boardwalk. For the Best Prices on the Web, Shop the THRIFTWeb Store. It's Smart to be Thrifty! Why Pay More? the financial crisis would be over! Destin: "The Luckiest Fishing Village in the World"
The Florida Keys: unusual but breathtaking: the warm, emerald waters nurture living coral that supports a complex, delicate ecosystem of plants and animals. Save BIG on Walt Disney World Tickets! The Tampa Trio Triplet Pass - Save up to 35% on Tampa Attractions! Delve into three perfect attractions for your trip to Tampa Bay for one low price with the Tampa Trio Triplet Pass that includes admission to Tampa�s Lowry Park Zoo, the Museum of Science and Industry (MOSI,) and The Florida Aquarium. With tickets from BestofOrlando.com, you can explore these fun and educational hot spots with the convenience of one combo ticket. Save up to 35%! The East Coast of the United States stretches from the wilds of the Canadian border to the beaches of the Carolinas, Georgia and Florida, the eastern seaboard of America offers a wide diversity of visitor experiences. It is an area that conjures up so many perfect holidays it is difficult to know where to begin. From the classic Autumnal kaleidoscope in deepest New England to the vibrancy of a three or four night shopping break in New York, there really is an endless list of possibilities. From the colonial history of Boston and Philadelphia to Washington DC's superb museums and government buildings to the golf courses and beaches of the Carolinas , there is so much to do and so much to see, one visit is not enough. America's history may be brief, but it is packed with interest, from the site of the Boston Tea Party to the Liberty Bell and the battlefields of the American Civil War and the War of Independence, the East is filled with significant sites from the country's past. Take a self-drive holiday from Washington DC, through Virginia and explore and learn and enjoy. If American history is not your scene, there are enough Natural Wonders and National Parks to impress most visitors. The thunder of Niagara Falls, the serene beauty of The Berkshires in Massachusetts, the gorges of the Delaware River Gap where the Delaware River cuts through the Appalachian Mountains in New Jersey and Pennsylvania, breathtaking views abound.